Starbucks continues to amaze us. It was reported by multiple muggers that SB is releasing no less than a bunch of You Are Here Christmas mugs for European countries. Can you believe that? One of the first to be confirmed with live pictures is Berlin, Germany. 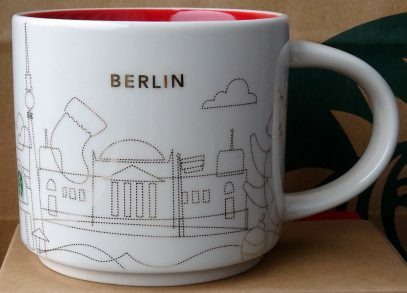 It is indeed the copy of regular YAH Berlin mug. All elements are there, but painted in gold. – Fernsehturm Berlin – television tower built between 1965 and 1969. It is the tallest structure in Germany and it has become one of the most recognizable symbols of Berlin. Interesting detail – the sphere is a visitor platform and a restaurant which makes the full turn every 30 minutes. – Berlin Wall – a barrier built by GDR(German Democratic Republic) dividing Berlin between 1961 and 1989. The fall of the Berlin Wall become a symbol of German reunification, which was formally completed on 3 October 1990. Almost forgot to mention another Christmas element making this mug special – Christmas sock! I expect this mug to be a limited edition and my advice is to buy it if you can. You will always be able to sell it later with a profit. Just look at what YAH Christmas Hawaii is selling for. From this Xmas YAH is the SKU# 011063852 it is sold in nearly all Starbucks Shop in Germany not only at Berlin !! !